A lot of words rhyme with Trump. 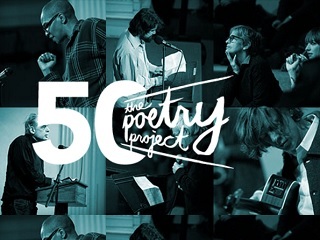 But to the credit of the participants in this year’s annual Poetry Project New Year’s Day Marathon held at St. Mark’s Church-in-the-Bowery in the East Village, these wordsmiths opted for a much broader approach. Bob Rosenthal stood at the podium in the sanctuary of St. Mark’s Sunday afternoon and read “Ode to Mendacity.” …Rosenthal wrote this poem specifically to read at the marathon. He says it’s about the nature of truth and lies in the wake of the presidential election. The late poet William Carlos Williams wrote, it is difficult to get the news from poetry, yet men die miserably every day for lack of what is found there. Waldman says that in the so-called post-truth fog of 2017, we need poetry now more than ever.